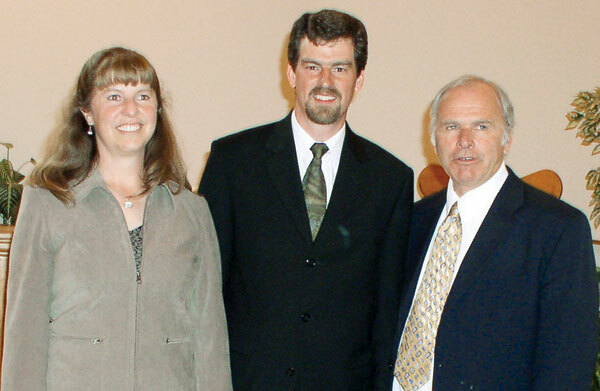 Donita and Tim Wiebe-Neufeld are ordained in May 2006 by Jim Shantz, Mennonite Church Alberta conference minister. As far as I know, I’m the only one. I’m the only home-grown Alberta woman who left the province, studied in Mennonite institutions, and is a pastor back here. Friends in other provinces wondered, “Why go back?” They knew Alberta’s redneck reputation. Happily, stereotypes are never the whole truth and sometimes they are lies. As a pastor I’ve encountered a few stereotypes, but parents, friends, teachers and mentors in the church have ensured that these were not obstacles to my calling. I was 19 when I preached my first sermon at Bergthal Mennonite, my home church, near Didsbury. Afterwards, C.G. Neufeld, a respected elder and former pastor, said to me, “I never thought women should be in the pulpit. Now I am going to reconsider that.” His words greatly encouraged me. Another person said she believed God was calling me to ministry. Although this went against her former thinking on the issue, she always supported me. 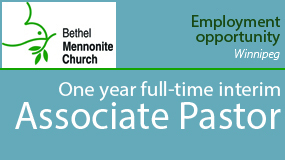 While studying in Waterloo, Ont., I had concurrent part-time jobs as an associate pastor at Wanner Mennonite Church and as a seniors chaplain at Fairview Mennonite Home. Both communities nurtured my call to ministry, and I found that my gender was an asset. The assumptions of what a pastor was didn’t easily fit a woman in her early 20s and perhaps even gave me a kind of freedom. I found both youths and seniors willing to share openly with me. I had the privilege to hear stories from life’s beginning and ending perspectives. The stereotype of women being good communicators may have worked in my favour! After a sermon at Fairview, I asked the 80-year-old worship leader what he thought of a young woman preaching. He laughed and said, “I’ve seen so much change in my life, I’m comfortable with it.” His acceptance and encouragement helped me to be comfortable with it too. Subtle forms of gender stereotypes are occasional irritants. Generally, these will disappear if I focus on what I’ve been called to do and allow others to support me. When my husband Tim and I first shared a job, people would sometimes come to me with their personal questions and would ask Tim the work questions. It put me in the awkward place of feeling I might have to be pushy to be taken seriously. Tim, however, became adept at noticing the problem. If a question was about something I worked on, he’d redirect it to me even if he knew the answer. In time, people saw us as equal partners. Currently, some irritants still happen, although they are infrequent. Last year, after I did a presentation at a local community church, that pastor called Tim to the front to thank him, even though all he did was accompany me and eat lunch! We laughed about that. I don’t think of myself as a woman pastor. I’m simply a pastor who happens to be female, a pastor thoroughly convinced we need both genders using their unique gifts as we seek to be the church in the world. Donita Wiebe-Neufeld is co-pastor of First Mennonite Church, Edmonton, Alta., and the Alberta correspondent for Canadian Mennonite.